Masterpieces by all the guests using paints & Spin Art! It seems that art and crafts has become a common request in our home these days. So it was no question when it came to planning my son’s 3rd birthday party what the theme was going to be. Instead of the traditional “art” party we decided to keep it more specific and make it a painting party and since painting is his favorite art activity I knew it would be a hit. Painting, painting and more painting! The kids were each given a smock and a table was set up for some serious paint time. Once there masterpieces were complete, they were hung to dry and put in a colorful frame to take home. 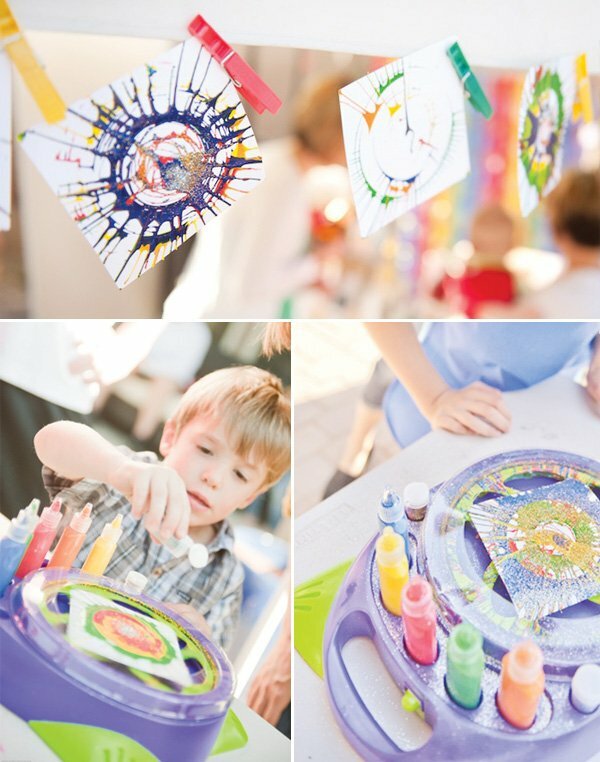 Another popular paint activity was the spin art machine. The kids went crazy for this thing… (note to self) buy two next time. I kept it simple. Hot Dogs, Brauts, potato salad, macaroni salad and yummy fresh fruit… in every color of course. 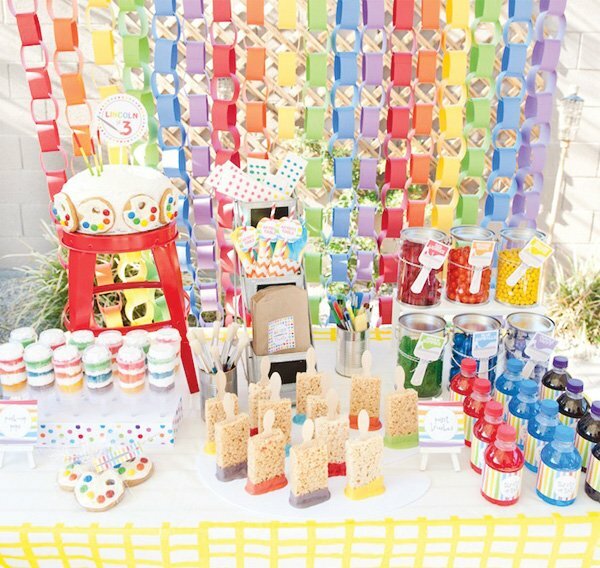 This is where I really wanted to have fun with the theme… fun, colorful and covered with sweet treats! 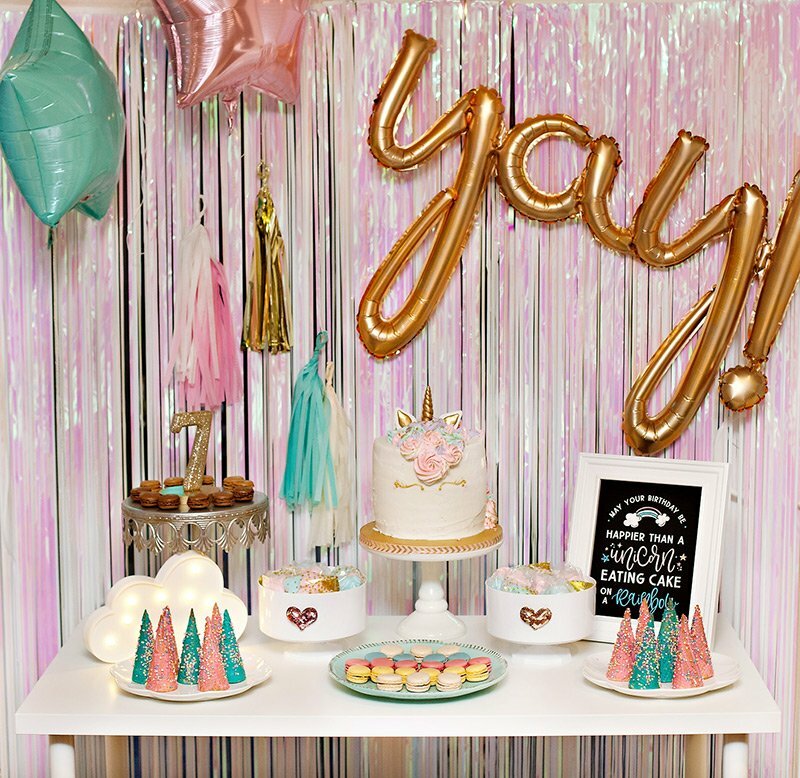 The backdrop is a super simple (and cheap) DIY project and something the kids can help with too. Paper chains have been around for ages and are a great way to decorate a party. The cake was displayed on top of an art stool that I found at Hobby Lobby and painted red to match. The latter-like stand was also a fun way to display some of the party goods. This too was a Hobby Lobby fab find and was great for holding the custom treat bags, “artist tools” and some candy dots. The “artist tools” were a fun way to display the serving wear. I used chevron bitty bags and filled them with cutlery, napkins and paper straws in coordinating colors. 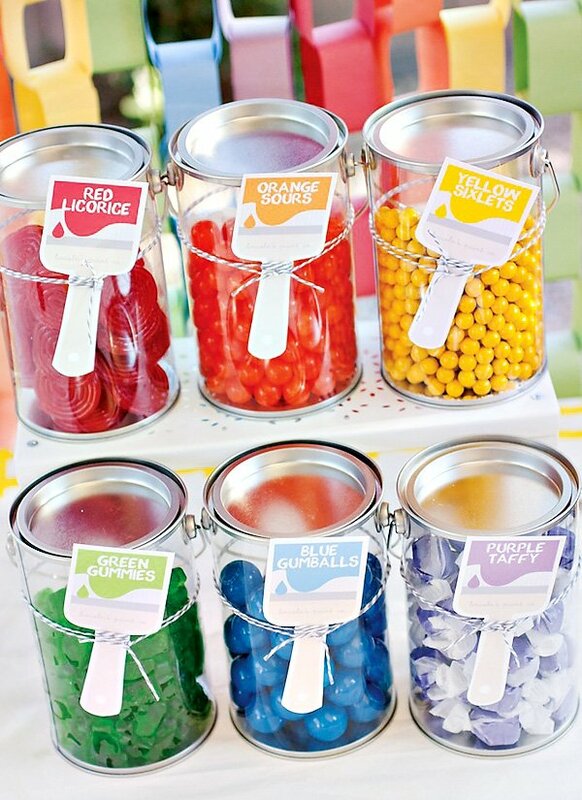 The clear paint cans were my favorite party element. 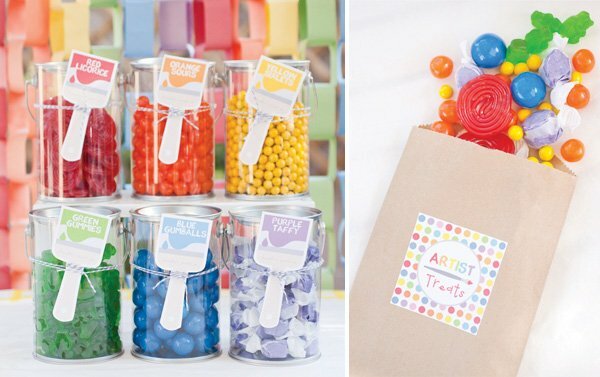 These were found at Michaels and filled with candy in every color and finished off with a personalized printable paint brush label. The cake was a simple white cake with cream cheese frosting and surrounded with homemade paint palette cookies. 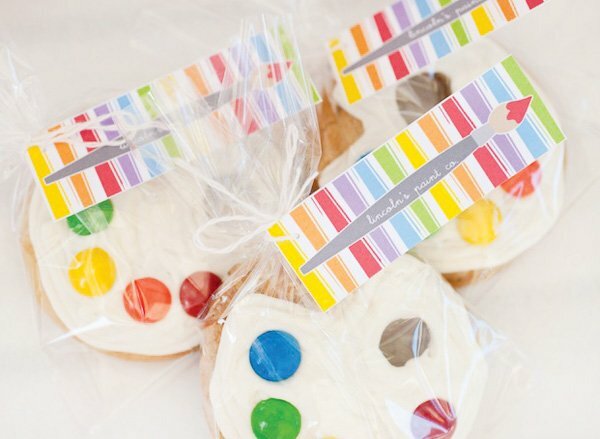 These cookies are super easy to make, using sugar cookies formed into the palette shape and m&m’s for the colored paint dots. 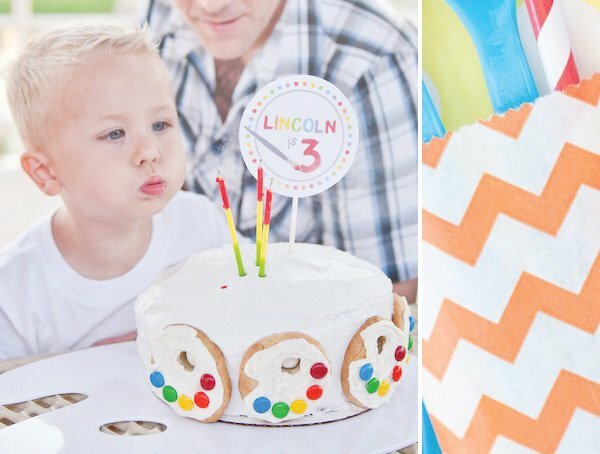 The push-up pops were a fun way for the kids to enjoy their own personal layered birthday cake. These were layered mini cupcakes with cream cheese frosting between each layer….. YUM! 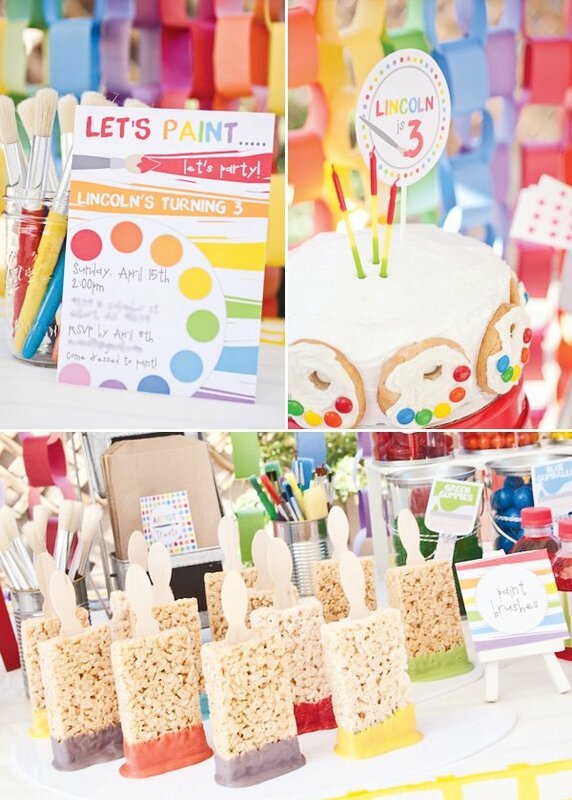 The rice crispy treat paint brushes were not only the centerpiece of the table, but were the party favorite. I was so excited when I came across the pre-made rice crispy treats, no baking necessary and such a time saver. Simply place an ice cream spoon into the rice crispy treat and dip each one into the colored candy melts and voila! 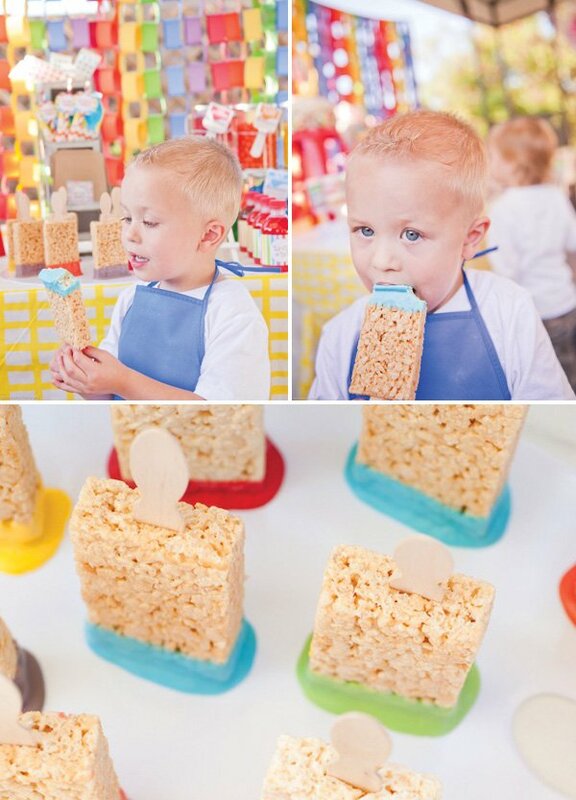 LOVE the rice krispie treat idea, so adorable! WOW! LOVE it all!! I’m sure the kids had an absolute blast – how could they not?! Amazing! I love it too! great job! love how everything is coordinated with painting just amazing! Such a great creative party! Where did you get the spin art machine? Love all the decorations! You did an amazing job! 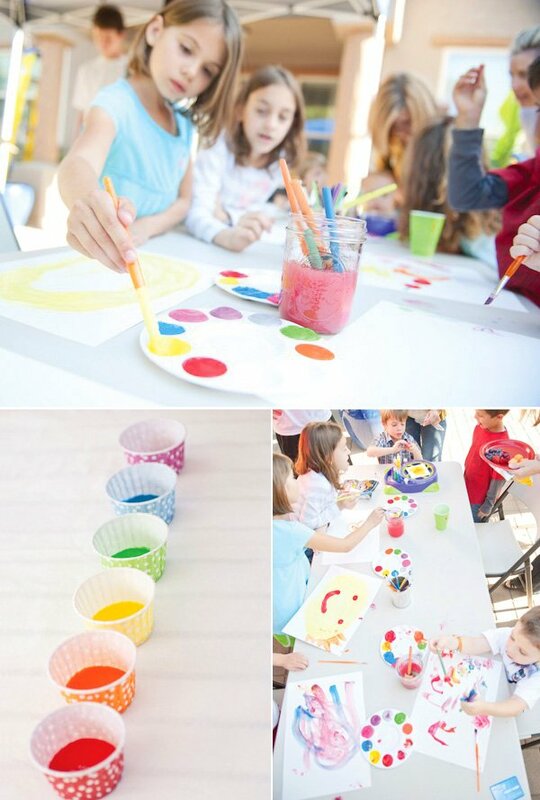 The rice krispie paint brushes are the cutest treats I’ve ever seen…such wonderful creativity and detail! Where did you find the drinks? I love these! Thanks! We found these at Walmart. I believe some Toys r us’ sell them too. LOVE THIS IDEA! So Pretty and Bright. I am going to try to remember every detail! LOVE LOVE LOVE. So darling! I love the paintbrush krispie treats! Fabulous work, girls! 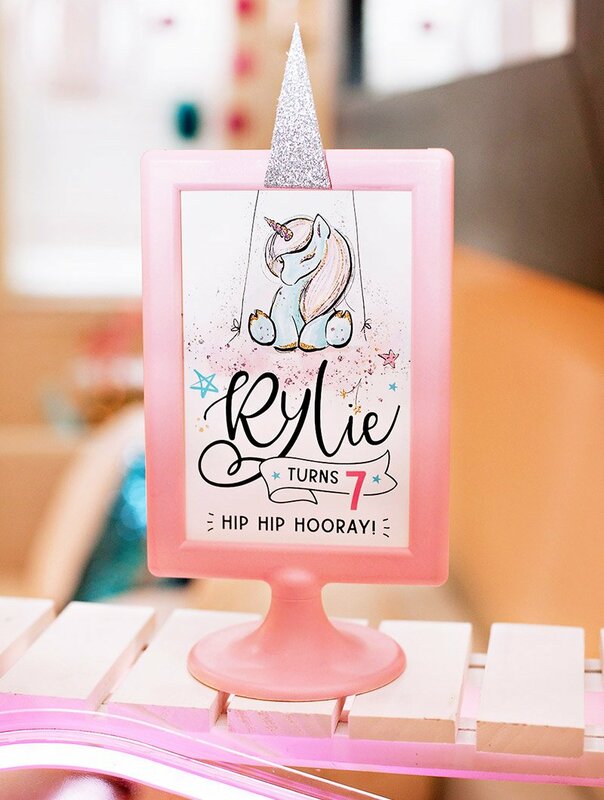 Did you get the printables from somewhere or did you make them yourself? Love this idea! 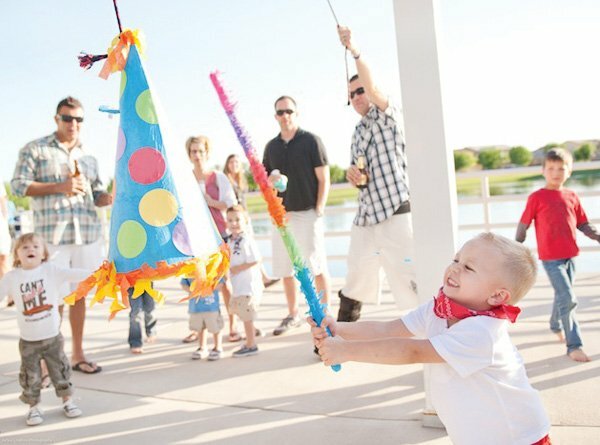 Soooo precious, and it looks like so much fun! You put as much thought into the activities as the decor, and the end result is magnificent. So clever girls!! I love it and your work always amazes me! The backdrop is my favorite!! I love it! Where did you find the paint cans? I'm pretty sure they sell them at Michael's stores. 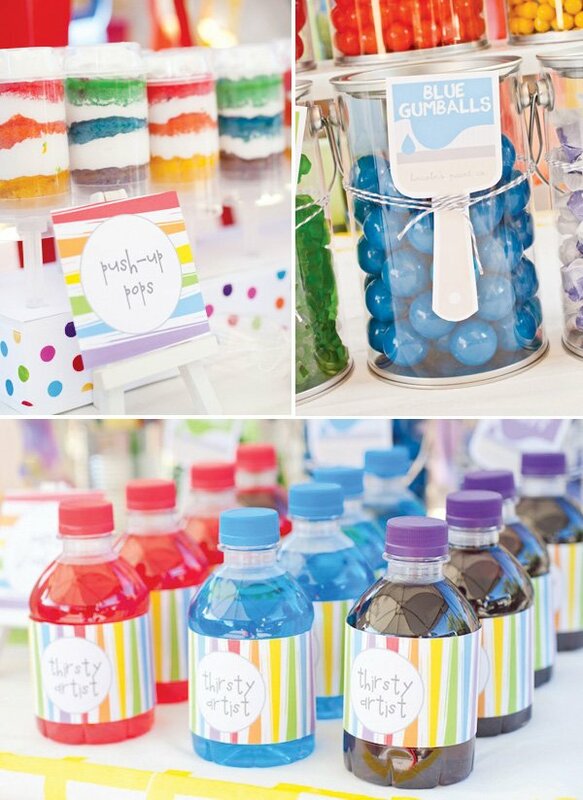 my son will be turning 10..this will be a really fun idea, with a few bigger boy touches!~ great thank you! Absolutely LOVE it! We just had our 1st child (a baby girl!) and I’ve already been planning her birthday parties for a while, and an art party theme is oneI’ve always liked! 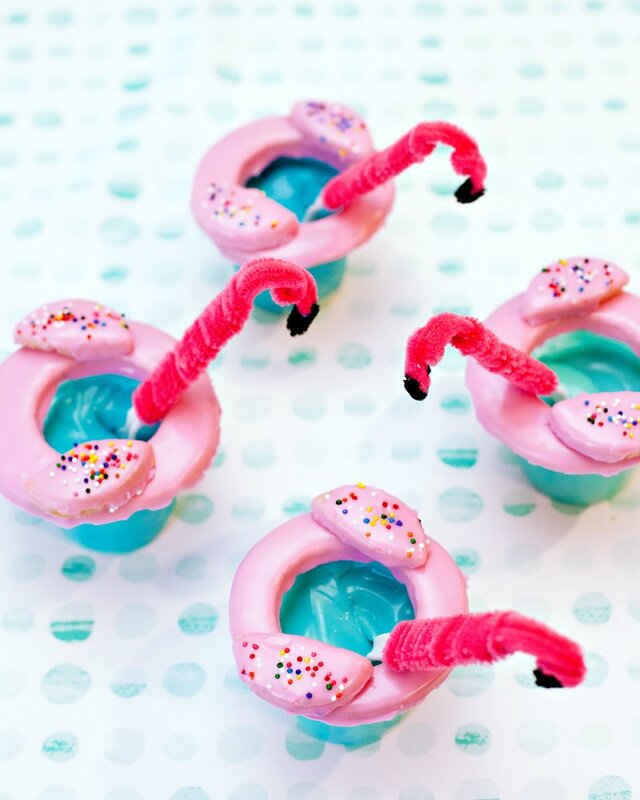 I’ve seen lots of cute ideas on Pinterest! But your ideas are so great too…I will definetly be using some of them! Very cute! Love all the creative ideas. 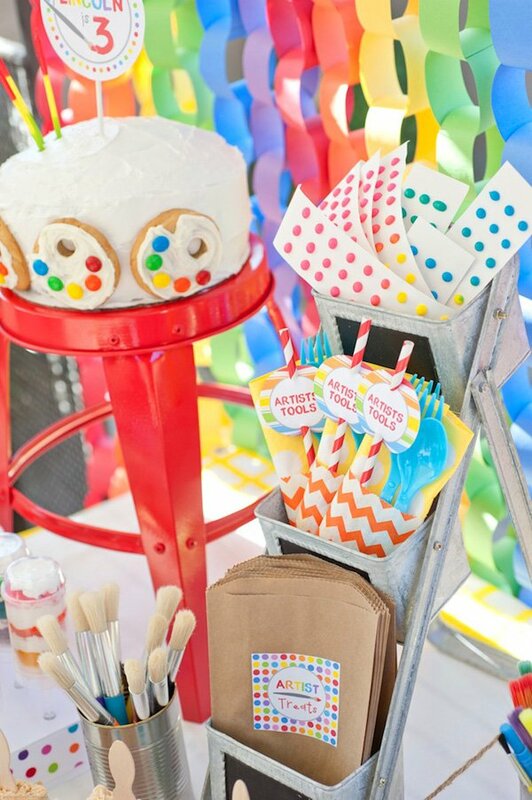 Im having a rainbow paint party for my daughter soon, and am looking for a stand like the one you used for the artist tools, etc. You said you got it at Hobby Lobby…do you remember what section you found it in? I’m having a hard time tracking one down that is just like it! Thanks! What candy did you dip the Rice Krispies in? I have to ask too, what kind of spin art machine is it and where did you get it? I love the colors it comes with. Hi Romina! You can find the spin art machine at Target. Where do I buy the sticks that hold the rice bubble treats please? What brand rice crispy bars did you use? What brand candy melts did you use? Did you place them on a white chocolate melt to get them to stand up?